Year-to-date total return for the muni market is broadly flat following last year’s exceptional performance, which is fairly positive, all things considered. Flat YTD returns may indicate a positive second half of the year given how the market has held up to recent credit issues, positive net debt issuance and limited broker-dealer liquidity. Recent credit events out of Puerto Rico (PR) continue to draw negative attention to the muni market. Puerto Rico and its component units are locked out of the capital markets, and a planned value added tax (VAT) was abandoned. Instead, the territory raised the sales tax to 11.5% from 7% in order to meet budgeted expenditures. Puerto Rico has become less of a systematic credit risk to the investment grade municipal market since its downgrade to junk status. By and large, investment grade municipal mutual funds have reduced their exposure to PR, except for major fund companies Oppenheimer and Franklin Templeton, which are involved in legal proceedings with the territory. Another recent credit event is the downgrade and subsequent divergent credit opinions for the City of Chicago. Moody’s has the City of Chicago at Ba1 (high yield), and S&P rates it A- (investment grade). The market is pricing the City of Chicago like a high yield issuer. This past week Chicago issued $675MM in debt, and bonds maturing in 2034 were priced to yield 5.75%. Generally, the debt issuance was a success because it indicates that Chicago has access to the capital markets. It was also a positive credit development because Chicago was able to take out some of its variable rate debt and exit a large portion of its “out of the money” interest rate swaps. Chicago was not the only issuer this past week. Since February, the muni market has seen heavy gross issuance resulting in positive net issuance YTD. 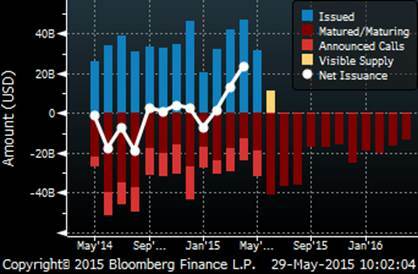 The Bloomberg graphic below shows the supply dynamics in the muni market, with the white line indicating net issuance. Technical supply and demand factors were a large contributor to 2014 muni market outperformance. YTD supply and demand factors are more balanced, but June’s large number of maturities and limited expected supply could indicate a positive second half of 2015 performance.